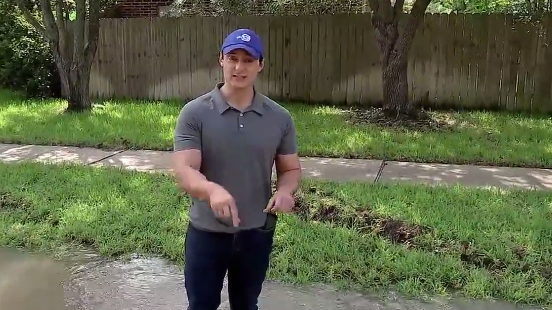 A family whose son died in floods brought on by Tropical Storm Harvey is pleading with first responders, volunteers and residents to be aware of unseen dangers beneath the water. Tuesday around 2:30 p.m., Andrew Pasek, 25, and his friend Shawn went to a home in the Bear Creek 1 subdivision near Highway 6 and Clay Road. They were there to get Pasek’s sister’s cat left behind in the rush to evacuate their home. Eyewitness News Reporter Steven Romo sat down with Andrew’s mother, Jodell Pasek, Wednesday. Not even 24 hours after her son died, she wanted to get the message out about the unseen electrical danger. Andrew stepped in the yard unaware that a landscape light electrified the water. He stumbled and grabbed the lamppost, using his last words to warn his friend to stay away, his mother said. “They couldn’t even help my son. They couldn’t resuscitate him. He was in electrified water,” she said.